Cookietown, Oklahoma is located at the crossroads of U.S. 277/281 and SH-5A, in Cotton County, near the Texas border. The tiny southwestern Oklahoma community was named after a local business owned by Marvin Cornelius back in the early twentieth century. 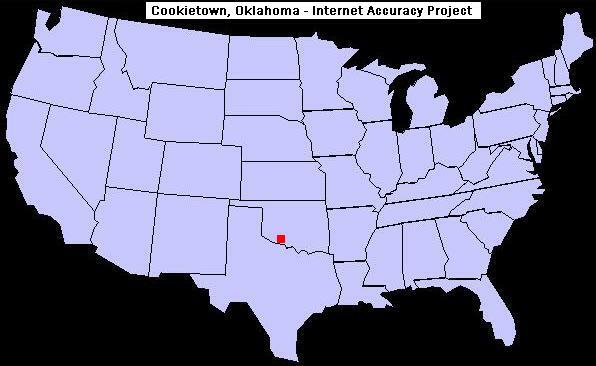 Time Zone: Cookietown, Oklahoma is in the Central Time Zone. * Fort Sill Military Reservation and National Historic Landmark, north of Lawton, OK. Camping, fishing, hunting, archery, picnicking, hiking, rock climbing, photography, boating and water-skiing. Bison, elk, deer, wild turkey, coyotes, hawks, quail, dove, ducks, rabbits, prairie dogs, otter, owls, raccoon, and the armadillo.